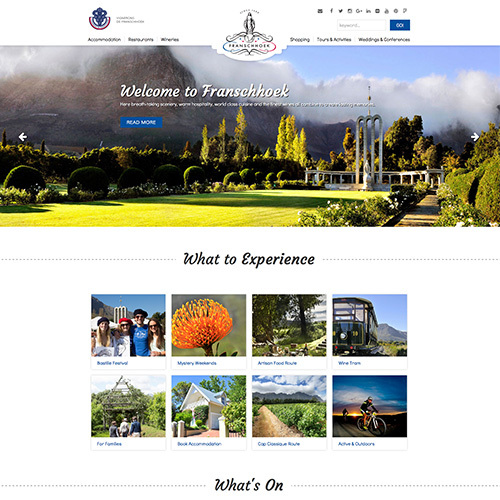 GenSix Digital was commissioned to redesign and develop the Franschhoek Wine Valley Tourist Associations website from the ground up, utilising their current database and RSS feeds. We also developed a custom mapping system using Google Maps API so that visitors could navigate between Wine Farms, Accommodation, Area Activities and Restaurants. About Franschhoek Wine Valley Nestled between towering mountains in the beautiful Cape winelands lies the magnificent Franschhoek Valley. This is the food and wine heartland of the South Africa, where splendid wines are grown and Franschhoek's top chefs create international cuisine. The area's breath-taking scenery, warm hospitality, world-class cuisine and fine wines all combine to create lasting memories.